On a cold evening in December 2014, I learned of Zoja's Law, a proposed piece of legislation that would provide government funds for the diagnosis and treatment of Serbian children and adults with rare diseases. News footage shared online showed how the members of the Serbian National Assembly failed to accept the proposed law into parliamentary procedure. The footage soon went viral across the Serbian web. People were angry. I was angry. Zoja's Law, first suggested by the parents of a girl named Zoja who battled Batten's Disease for three years and passed away in 2013 at the age of 6, proposes that the government provide funding for children with rare diseases, which often go undiagnosed for long periods of time in Serbia. The law asks that a time limit of six months be placed on diagnosing rare diseases and disorders in children and minors, after which the government would cover the cost of either sending these young patients abroad for proper diagnosis, or of bringing in foreign experts for diagnosis and treatment. The proposed law was turned down by the National Assembly five times over a period of some 18 months. The video I and many in Serbians watched over and over again in disbelief shows members of the Serbian National Assembly voting on whether to accept the proposed law into procedure. Of the 250 members of the Assembly, 185 were present that day. When the proposal was brought to the floor by Dr. Dušan Milisavljević, an opposition MP who had volunteered to introduce the proposal on behalf of the group of parents who had written it, 26 members of the Assembly voted “yes”, zero voted “against”, and zero voted to abstain. The remaining 157 MPs simply didn't bother to vote. 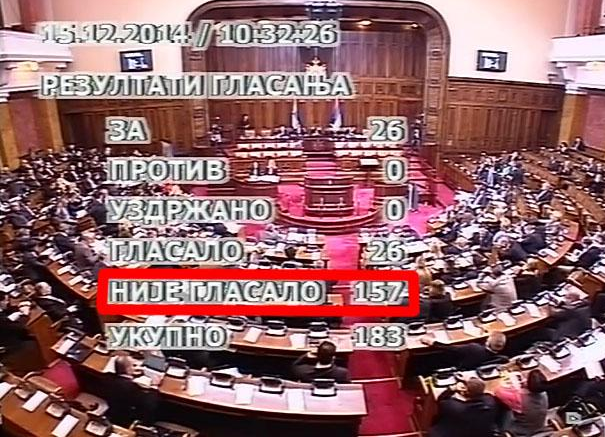 A screencapture of the video of the National Assembly vote for Zoja's Law that circulated the Serbian Internet for days. This post should probably have started, “During my school winter break….” I am a 15-year-old high school student. I can't vote. I can't propose a law. And I definitely can't be a member of the National Assembly. Still, watching the video made me feel deep disappointment and anger at the inhumanity of the politicians that run my country. What I could do was try to effect change by other means. I first asked a family friend to introduce me to Dr. Dušan Milisavljević, and I chatted with him on Facebook. We decided that the first step would be to use my knowledge of online tools to raise awareness about the Assembly's failure to vote, and Zoja's Law in general. The next day, I set the stage for our online campaign. I created a video in which I promised that I would not vote in the next parliamentary election (by that time I’ll be old enough to vote) for any of the MPs who had not bothered to vote for Zoja's Law. When I went to the printing place around the corner from my home to print the pages bearing the messages I would use in the video, a man who worked there asked me to explain what Zoja's Law was. Once I explained it he waived the cost of the printing and wished me the luck with the campaign. I set up a Facebook page to promote an online petition I created. Within days the page had attracted hundreds of fans, and in less than three weeks the petition received over 3,700 signatures. Dr. Milisavljević and the group of parents, led by Zoja's mother, would use the petition signatures and online commentary of others to do what I couldn't do: show Assembly members that people were aware and supporting Zoja's Law. The group of parents had also started a Facebook group and launched an online campaign which saw parents of sick and healthy children from all over Serbia begin sharing photos of their kids holding messages in support of Zoja's Law. They didn't know who I was and I didn't know who they were, but we began sharing each other's posts, united by a cause we all cared about. Not everyone was supportive. Some didn't believe it was possible to make a difference, mostly because of their general lack of confidence in our politicians. Others reminded me that online petitions aren't as effective in Serbia because they aren't considered to be valid. A petition in Serbia usually has to be registered and then signatures gathered by a deadline, usually of 7 days. I decided to create an online petition anyway because it was faster, more visible, and I was not legally old enough to start an official petition or even sign one. People also told me I was wasting my time and that my efforts were pointless. Most people, though, complained about Serbia's MPs and supported our joint effort to raise awareness about Zoja's Law. In a way, they were all right. The petition, my video, the Facebook page would have achieved nothing if I hadn't collaborated with the group of parents and the one MP proposing the law. On January 8, Dr. Milisavljević invited me to join him and the group of parents of undiagnosed children who had proposed the law at the National Assembly building for a meeting. They had all just had a meeting with the Minister of Health, who, after the voting fiasco in December, had promised that the proposed law would be accepted into procedure at the next session of the Assembly after the holidays. 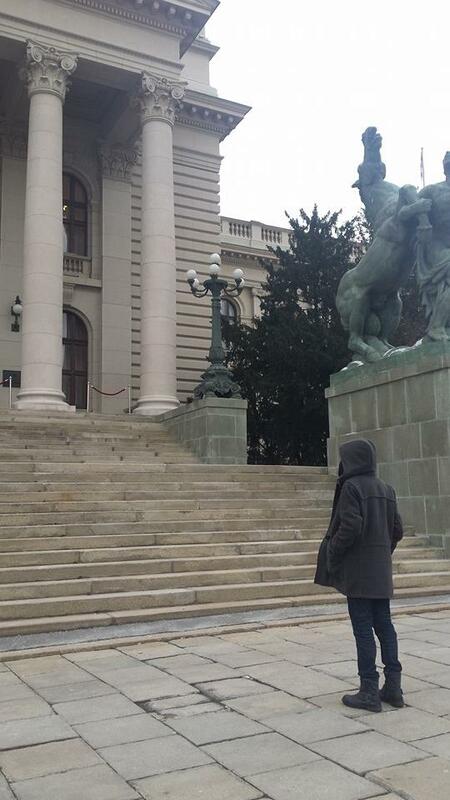 It was my first time at the National Assembly. Dr. Milisavljević greeted me at the entrance, where I was waiting for him, watched by two confused security guards. At 15, I don't have an ID card, which you’re usually required to show before entering the building, so they just jotted my name down in a notebook. Inside, Dr. Milisavljević introduced me to the group of parents of children with undiagnosed genetic diseases or disorders. Zoja's mother was there. She greeted me with a hug. I had heard the stories of Zoja and other kids and they had angered and saddened me, which made it difficult to talk to her and the other parents there without getting emotional. But while Zoja's mom and the other parents looked tired, they didn’t behave like they were burdened with the problems they have. As I sat at one of the tables in the cafe of the National Assembly of the Republic of Serbia with them and Dr. Milisavljević, I wondered how they did it. How they had so much hope. How they kept the smiles on their faces and the cheer in their voices. I spoke little. I mostly listened to their stories. Many of them described problems in the national health system: tests that led to no result; differing opinions from doctors; doctors’ lack of knowledge about rare diseases; how difficult it was to simply not know what was wrong with your child. I learned that undiagnosed patients in Serbia aren't even considered ill. If there is no code for their illness known to the Serbian health system, patients cannot not be categorized or treated and are essentially invisible to the system. I went with Dr. Milisavljević to his office to print out the petition. The women who worked there were surprised by my age and my initiative, but they were very supportive and asked if there was anything else I needed. I answered no and they wished me luck. We didn't get to hand the signatures in that day. After several more meetings with different members and legal aides of the government, more campaigning, and several media appearances by Dr. Milisavljević and Zoja's mother, as spokesperson for the group of parents, the proposal for Zoja's Law was amended and the Serbian National Assembly voted to pass the Law in a session on January 23, 2015. Of 250 members of the National Assembly, 166 were present for voting that day. 163 members of the Assembly voted for Zoja's Law, zero voted against, zero abstained, and only 3 decided not to cast a vote. This time around, the voting was well covered by media. Some said it “united members of the Assembly”. Others commented that Assembly members and their political parties were just using the opportunity for a few easy political points. Either way, mission accomplished.